Where are all these kitties coming from? For years, I hardly spotted any in the neighborhood, and now they appear quite unexpectedly—as did Stalker (my name for him) on Nov. 12, 2016. 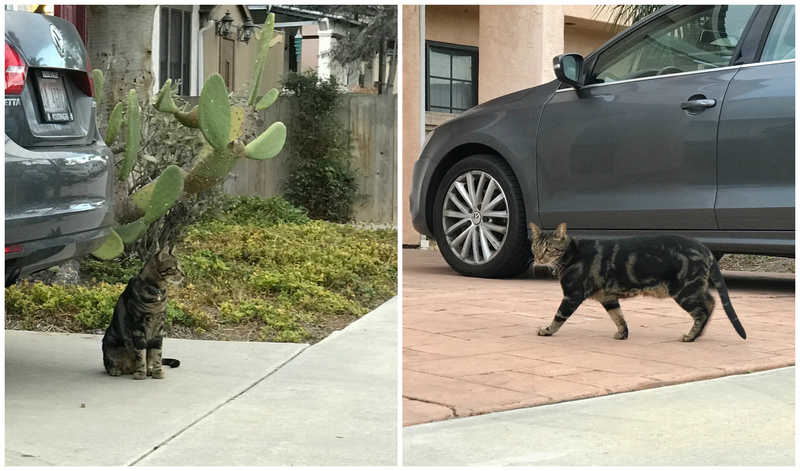 My wife and I walked along Campus Ave. to her dad’s apartment, when Anne saw the slinky, skinny cat in the distance. I pulled out iPhone 7 Plus, getting off three shots. I horizontally cropped two verticals into a single Featured Image. The other featured beautiful beasts: Scruffy, Roly Poly, Woo, Skull, Biscuit, The Colonel, White, Chipper, Frisky, Stretch, Needy, Farfisa, Mates, Hunter, Pee-Pee, Blue, Blue Too, Bonded Pair, Patience, Fess, Jumper, Frenemy, Looker, Cozy, Scout, Lurks, Skit, Mini, Betty, and Black and White.